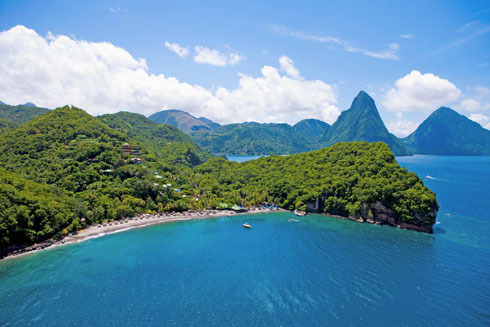 St. Lucia's surroundings will inspire action, but also encourage relaxation. You don't have to choose one or the other, as your time on the island can be divided between exhilarating participation and quiet rejuvenation. The same resorts that offer morning yoga and meditation spaces also stock waterfronts with kayaks, windsurfers and snorkel gear, and provide tennis courts, fitness rooms and guided hikes. Join in on a group adventure, or make each day your own. Take a mid-afternoon break in a hammock slung between palm trees, then rally for an evening of music, dancing and mingling with local crowds at a nearby fishing village. Saint Lucia's resorts tend towards the low-key and intimate, which is ideal for anyone who wants to intersperse active pursuits with periods of quiet relaxation. The island's natural surroundings and non-commercial vibe will be appreciated by anyone who is seeking an escape from the over-stimulation of modern life. Don't settle for just a poolside routine. Expand your horizons with the full range of active and introspective activities that are an integral part of the Saint Lucia experience. Try morning yoga, swimming in a waterfall or exploring a coral reef, then end the day with sunset relaxation. A great time to put this all together is during the island's annual Wellness Month in November. Start the day with yoga on the beach at Anse Chastanet. Add water sports to the mix with Ti Kaye's Wine, Water and Wellness plan. Set sail for a coastal cruise to Anse Cohon or venture into blue water to meet wild dolphins. Reward your hiking efforts with ocean views from the top of Gros Piton, or watch the sunset from the deck at Jade Mountain. Be ready for anything from snorkeling and sailing to hikes, workouts and savasana. This means a good pair of walking shoes or trainers, sandals, comfy shorts, yoga or workout wear, a bathing suit or two and a small backpack for day trips.